Long shadow design is a variation of flat design to which shadows are added, creating the illusion of depth and resulting in a design that looks three-dimensional. In this tutorial we will be creating a jQuery plugin that will allow us to easily transform a flat icon by adding a fully customizable long shadows icon. If you are interested in a complete jQuery plugin for adding long shadows to icons and text, check out the Long Shadow jQuery Plugin on CodeCanyon. In this tutorial we will take a look at the elements of long shadow design, and we will create a simple jQuery plugin that will allow us to control these elements. What Are the Elements of Long Shadow Design? The main element, or the element casting the shadow. The shadow length, usually very long and therefore giving the name of the effect. The shadow length also gives the illusion that the main element has depth. The shadow direction or angle. In the real world, this is determined by the light source position. As a rule, all the shadows cast by a light source have the same direction. The shadow color and opacity. The light source color affects the color of the shadows. Also, the stronger the light source is, the darker and crisper the shadows. These elements put together create the illusion that the main element is not flat, but actually a 3D object that casts a shadow. Now let's create the jQuery plugin that would allow us to control these elements. Create a folder to hold the project files. Let's call this folder long-shadows-jquery-plugin. Inside the project folder, create a file and call it index.html. This will contain our HTML code. In the project folder, also place the heart.png icon that you can find in the attachments for this tutorial. shadowColor: The color of the shadow that our element casts. shadowLength: The length of the cast shadow. shadowAngle: The angle of the shadow. shadowOpacity: How opaque or transparent the shadow is. spacing: This is an attribute we did not mention in the previous section. However, we need this to allow the expansion of the space around the element for which we create the long shadows. In this way, the effect will be more visible. Let's start the implementation. To create the long shadow, we will make use of the HTML5 canvas component. We can create an in-memory canvas on which we will draw a copy of the original image element and its shadow. To draw the shadow, we will simply draw copies of the image element one on top of another, with a slight offset. The number of copies and the offset are calculated using a simple polar coordinates transformation based on the shadowLength and shadowAngle parameters. Also, we will have to color these copies according to the color of the shadow set by the shadowColor parameter. Because we draw the shadow as multiple images on top of each other, we will draw them in reverse order, from back to front, starting with the piece of the shadow furthest from the image element. Then we have to set the opacity of the resulting shadow via the shadowOpacity parameter. After drawing the shadow, we will simply draw the original image on top. The plugin is configurable by sending the parameters via the options parameter. These parameters will be merged with the default values and stored in the settings variable. This allows us to quickly use the plugin if we want, without having any parameters passed to it. The img variable will hold a reference to the original image element on which we apply the effect. We need to hook into the onload event of the image to make sure that the image is fully loaded when the effect is applied. Also, you will note that after the onload function we have img.src = img.src;. This will trigger the onload function, since we are not sure about the order in which the browser loads the image and the script. To draw the image on the canvas, we use the canvas 2D context and call the drawImage() function. This will draw a copy of the image onto the canvas, but what we need is a colored version of it. To do this, we make use of the canvas compositing operations. In our case, using source-in together with a rectangle colored with the shadowColor will result in an image with the same shape as the original image but with the color set to shadowColor. Please note that if you have an image with multiple colors, the result will be all in the same color, as indicated by shadowColor, which is correct in our case because we are drawing a shadow, and a shadow is usually the same color. The for loop takes care of drawing the shadow; however, it's drawn at full opacity. We would like to be able to set the shadow opacity using the shadowOpacity parameter. To do this, we use the copyCanvas() function, which makes use of a temporary canvas and sets the opacity of the canvas content to the specified value. We have to do this at the end, when the entire shadow has been drawn, otherwise stacking transparent images on top of each other would result in a gradient effect. The first line removes the onload handler from the image. We do this because in the next line we would like to set the image drawn on the canvas as the new src for the original image. If we did not remove the handler then we would have gone into an infinite loop. How Do We Use the jQuery Long Shadows Plugin? Now that we have implemented the plugin, let's see how we can actually use it and what result it produces. For this we will use the script.js file, where we will call the plugin we have just created. This instructs the browser that when the page finishes loading, it should apply the longshadows plugin to the element with the ID logo. For this, we make use of the tutsplus.png image that you can download from the attachments. Please note that we are able to combine the plugin with CSS styles, in this example adding the color rectangle around the icon. 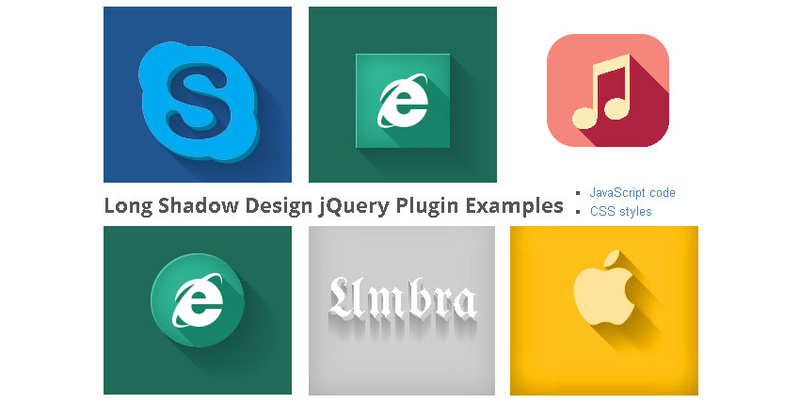 You now have the basics for creating a jQuery plugin which adds long shadows to your icons. You can build on top of this plugin and make it work for text, for example, or to combine multiple images and shadow effects. If you are interested in a complete long shadows plugin with even more configuration options, check out this CodeCanyon item: Long Shadow jQuery Plugin.